Rational Quality Manager works with the Rational DOORS Next Generation requirement management tool. You can link test cases and mark them as suspect whenever requirements are modified. Rational Quality Manager integrates with many test automation tools including Rational Functional Tester. 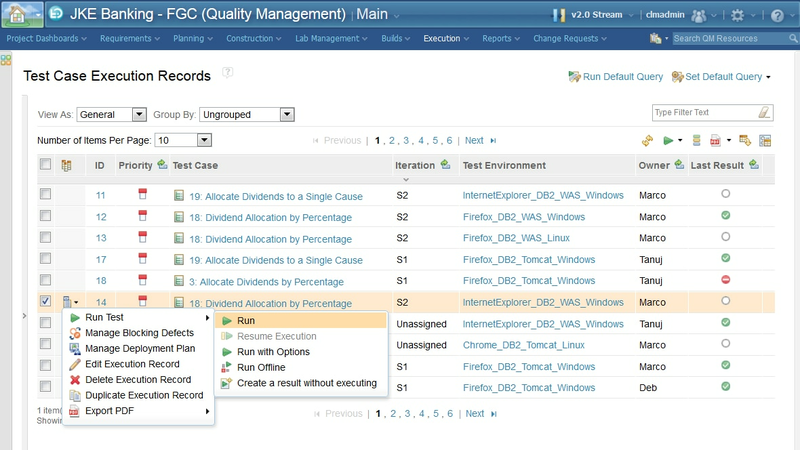 Execute tests with all kinds of tools and collect test results—all from a central location. Test plans clearly describe project quality goals and exit criteria, while tracking responsibilities and prioritized items for verification and validation. Support communication among teams that are geographically dispersed using features such as event feeds, integrated chat, review, and approval and automated traceability. Address the needs and concerns of quality managers, business analysts and release management using advanced reporting capabilities, making it easier to assess readiness for delivery. Provides risk-based testing for prioritizing the features and functions to be tested based on importance and likelihood or impact of failure, supporting risk management best practices.